If you're looking for high-yielding bank stocks you can trust, here are three that fit the bill. 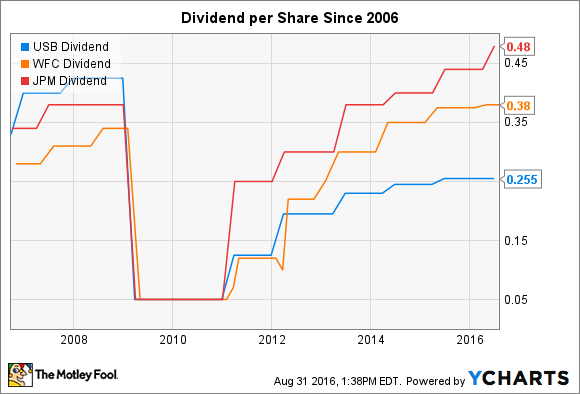 While almost all bank stocks pay dividends, not all dividend-paying bank stocks are equally worth buying. Some are better than others. Given this, I drew up a short list of the three best bank stocks for dividend investors. Without further ado, the banks that made the cut are Wells Fargo (NYSE:WFC), U.S. Bancorp (NYSE:USB), and JPMorgan Chase (NYSE:JPM). The first reason I chose these stocks is because they all pay above-average dividend yields. Anytime you're on the hunt for a dividend stock, this should always be your first stop. It seems like a truism, but if you're looking for a dividend stock, you want one that pays an above-average yield. What's an above-average yield? I'm referring to the average yield on the S&P 500. Right now that's 2.1%, according to The Wall Street Journal. All three of these bank stocks exceed this. Wells Fargo had the highest yield at 3.1%, followed by JPMorgan Chase at 2.9%, and U.S. Bancorp's 2.3%. The second reason I chose these three as the best bank stocks for dividend investors is because they have all demonstrated the willingness and ability to boost their quarterly payouts every year -- or, at least, every year since the financial crisis. Bank stocks are unique right now in terms of their dividend histories, as almost all of them had to slash their quarterly payouts during the crisis. Wells Fargo, U.S. Bancorp, and JPMorgan Chase were no exception. USB Dividend data by YCharts. However, unlike many of their peers, all three of these banks have since increased their dividends annually. And both Wells Fargo and JPMorgan Chase now distribute more per share each quarter than they did before the crisis. The net result is that investors in these stocks are safe to assume that their quarterly dividend checks are likely to continue growing over time, which helps to offset inflation for retired investors living on fixed incomes. The final reason Wells Fargo, U.S. Bancorp, and JPMorgan Chase make the cut as great dividend stocks is because they don't expose investors to undue risk of loss. It's important to keep in mind that banks, by nature, are fragile businesses as a result of the copious amount of leverage they use. The typical bank is levered by a factor of 10 to 1, or more. This means that a mere 10% decline in the value of an ordinary bank's assets would render it insolvent. In this case, however, all three of these bank stocks have shown a knack for prudence that allowed them to thrive through the financial crisis -- the toughest test for banks in a century. U.S. Bancorp emerged from the crisis as the most profitable bank in America. Wells Fargo more than doubled in size as a result of its 2008 acquisition of Wachovia. JPMorgan Chase was asked by the government not once, but twice, to step in and rescue flailing institutions. This prudence goes a long way toward explaining why Warren Buffett owns all three of these stocks either in Berkshire Hathaway's portfolio or, in the case of JPMorgan Chase, among his personal stock holdings. And, quite frankly, it's hard to come across a better endorsement than that. In sum, if you're looking for the best dividend-paying bank stocks, you could do a lot worse than Wells Fargo, U.S. Bancorp, and JPMorgan Chase.